THE JET OUTBOARD gurgled to a halt as I stepped out onto a vast gravelly shoal. The river that greeted me was daunting — featuring a yards-wide channel, variable flows, and trout that often seemed just out of range. It’s a scenario faced by big-river anglers across the country, and many a rotator cuff has suffered from the stress of repeated monster casts and long-distance mends. But these anglers are increasingly turning to a technical solution — a two-handed rod. Although originally designed for casting on rivers — such as the Spey — where high banks prevent a backcast, the two-handed rod has been re-conceived and redesigned to perform in many different angling situations. You can now find fishermen casting two-handers in the surf for stripers, in Alaska for salmon, on Midwestern rivers for steelhead, and even in saltwater estuaries for tarpon (about as far removed from a Scottish salmon river as possible). But where you don’t often see two-handers is on trout rivers. You’re obviously not going to bring the two-hander on a small mountain stream or a Western spring creek, but the longer rod offers serious bonuses for big-water anglers: you can reach fish that are much farther away, and you can keep the fly in the strike zone for longer, allowing you to cover a lot more water. Two-handed rods are best for larger trout in big, wide tailwaters. Now, imagine yourself in a very common position. The fish you had been targeting close to the bank have wised up. They’ve left the safe holding water you are standing in, and they’ve moved to midchannel — too far to reach and still get a drift with a standard cast. You know the trout are still feeding, if only you can drift a nymph to them. Here’s where a two-hander shines. The biggest advantage of overhead casting a 12-foot rod is obvious: extra distance. Because you’ll be fishing so far away, you’ll need an indicator. Unfortunately, ordinary foam indicators tend to rip apart under the extreme torque of Spey casting, and yarn indicators have a serious swamping problem. The solution is the balloon indicator, which is stretchable, unsinkable, and very durable. Plus, water balloons are available, in mass quantities, in any dollar store. 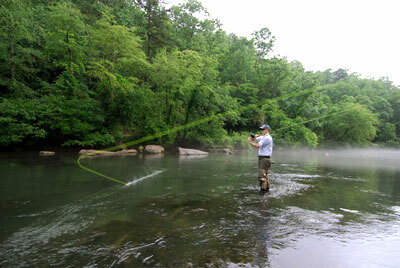 Once you’re rigged, make a quartering cast upriver, above the trout in the middle of the channel. When the fly hits the lane, immediately begin throwing large, floppy mends upstream, which will keep the line from sagging into the current and dragging. With a two-handed rod, you’ll be able to mend line for yards farther than a one-hander can manage. As the fly comes by your position, strip enough line in to high stick the rod. High-sticking a two-hander doesn’t have to be an up-close affair, either; you can easily keep a fly drifting 30 feet away. Two-handed rods are best for larger trout in big, wide tailwaters. Once the fly has passed you, begin throwing the same floppy mends out into the current upstream of the indicator, keeping the balloon moving at the same speed as any debris around it. The idea is to maintain just enough slack to keep the balloon dead-drifting, but not so much that you can’t set a hook. When the line gets far enough below you, it may be easiest to simply point your rod downriver and wave it lazily from side to side, working line out through the guides. Always pause at the end of the drift to allow the fly to swing because many trout will hit upon the rise. Should you be lucky enough to catch a fish on your first drift, remember to set the hook with the rod parallel to the water’s surface and to your downstream side if possible. If a fish is downstream of you, setting directly upriver at a long distance can pop the fly right out of a trout’s mouth. With a two-handed rod, you don’t need to set hard; the rod acts as a huge lever, giving you all the pull you need with a small jerk of the line and a sideways twitch of the rod tip. Fundamentally, traditional Spey casting is about keeping the line on the water. However, one of the advantages of light two-handed rods — such as the 5- and 6-weights appropriate for trout — is that you can still make an overhead cast. Indeed, an entirely new breed of rod, called a “switch rod,” — covered elsewhere in detail — has been developed to maximize this ability. Fortunately, almost any two-handed rod is capable of overhead casting with a short-belly Spey line, such as Rio’s Windcutter or Scientific Anglers’ Mastery Spey Shorthead. Conveniently, short-belly lines are also the most efficient for trout fishing. The biggest advantage of overhead casting a 12-foot rod is obvious: extra distance. With so much more elevation, particularly in the backcast, a 30 percent increase in total casting distance is not uncommon. But how can you use this extra reach? One option is the straight-upstream nymphing cast. Position yourself below a rock or piece of structure and unleash a long cast, dropping the fly right in the pocket. As the fly comes back to your position, strip line quickly between your legs, monitoring your rod tip closely to prevent the line from sagging downstream toward you. In faster current, a stripping basket makes a very convenient place to hold line. 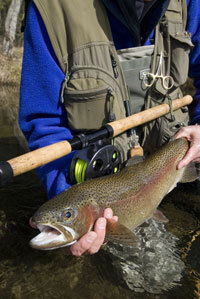 Large rods require large reels for balance, but you don’t need a heavy disc drag for trout. Antique reels like this Hardy Perfect provide a good compromise. If the indicator dunks, as it frequently will, set the hook straight back at you, right up into the fish’s jaw. If it doesn’t, simply wait for your fly to come by your position, high-stick it past you, and then pivot and begin feeding line downstream. In this way, you can search a run over 100 feet long, which is particularly useful in stained or smooth water where you can’t pinpoint any obvious trout lies. The technique also shines where river depth varies and you can only stand in one small area. Or, say you’re well aware that a certain big brown trout hangs out directly across from a midstream rock. Although the lie is out of range of most overhead casters anyway, the real trick is getting a good drift so far away, since any straight shot will immediately be dragged to the side by the current. 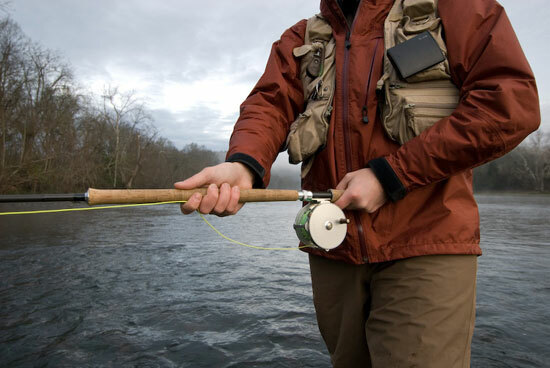 With a long, two-handed rod, you can make extremely good reach casts, since the rod tip can be positioned 15 or more feet away from the angler (more if the angler happens to have long arms). 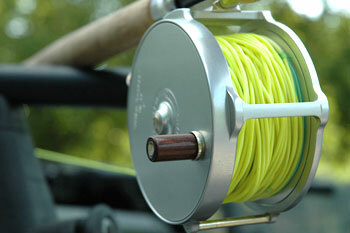 Using an overhead cast, as you shoot line, quickly jab your rod upriver in a big reach. The line will be anchored upstream of your position, giving you 15 or so feet of drifting room in which to throw a couple mends and give your nymph time to sink to the trout’s depth. In heavy current, don’t be afraid to crimp on a size BB or bigger split shot. A heavy two-handed rod can handle much more weight than you’re probably used to using, and the balloon indicator will keep the rig afloat. Spey Casting by Simon Gawesworth, Stackpole Books, 2004. Two-Handed Fly Casting: Spey Casting Techniques, by Al Buhr, Amato Publications, 2006. “Art of Spey Casting,” 2005. “Spey to Z : Spey Fly Casting DVD,” 2006. “Rio’s Modern Speycasting DVD,” 2006. In the Pacific Northwest, two-handed casting is synonymous with shooting heads and sinking tips. These specialized outfits have an application for trout, too: for fishing streamers, particularly at night. One of the advantages of shooting heads is the ability to feel when line is shooting out, which is especially helpful in pitch darkness — when the largest trout feed. Skagit lines, which have even shorter, heavier heads than short-belly Spey lines, were developed for throwing big heads and big flies. With a Skagit line on a 6- or 7-weight rod, and a 6- to 10-foot sinking tip looped to the front, anglers can effectively cover a fan of water the size of a football field. Find an appropriate shoal tail-out with deep, preferably unobstructed water below. As the sun sets, begin making casts well across and downstream. You can make Skagit-style Spey casts or simply throw overhead; the weighty head will cover a great distance either way. When the fly has sunk to the appropriate level, swing your long rod all the way to your downstream side. As the current swings the fly, it’ll transcribe a lengthy arc. You can help the presentation by varying the tension and occasionally letting slip some line, causing your sculpin or minnow pattern to sink toward the bottom, like a prey species about to founder. Though inefficient by any measure, one of the most entertaining ways to fish a two-handed rod is during a caddis hatch. Caddisflies, known for their tendency to skitter across the surface while ovipositing, can be imitated by a skated dry fly. The setup is very similar to streamer fishing; make an across-and-down cast, then slowly swing your rod to your downstream side, causing the fly to skate across the surface. A pattern that incorporates foam will help keep the fly afloat, but look sharp! Takes can be smashing. Casting two-handers for trout looks increasingly like the Next Big Thing in fly-fishing. As crowded river conditions grow worse, anglers seeking new and innovative ways to reach unpressured water are sure to turn to the extra reach and improved mending ability of these long rods. As when any new resource opens, you want to be the first to enjoy the bounty. With two-handed casting lessons now available in fly shops from Arizona to New York, this is no longer just a salmon fisherman’s game.